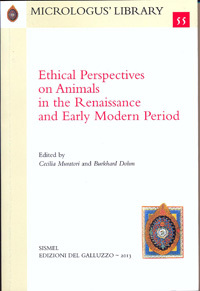 Cecilia Muratori, Burkhard Dohm, Introduction - Amber D. Carpenter, Eating Your Own: Exploring Conceptual Space for Moral Restraint - Matthias Roick, Animals at Court: Ethical Perspectives on Animals in Neapolitan Humanist Thought - Gabriella Zuccolin, Living with Animals at a 15th Century Court: Physiognomy, Dietetics and Poetry - Nicola Panichi, Montaigne and Animal Ethics - Guido Giglioni, Life and its Animal Boundaries: Ethical Implications of Early Modern Theories of Universal Animation - Cecilia Muratori, Eating (Rational) Animals: Campanella on the Rationality of Animals and the Impossibility of Vegetarianism - Burkhard Dohm, Vegetarismus-Konzepte im deutschen und englischen Spiritualismus des 16. und 17. Jahrhunderts - James Vigus, "That Which People Do Trample Upon Must be Thy Food": The Animal Creation in The Journal of George Fox - Kathrin Schlierkamp, Die Kontinuität der Natur und die Verantwortung für Tiere und Umwelt in Anne Conways The Principles of the Most Ancient and Modern Philosophy - Rhodri Lewis, Thinking with Animals in the Early Royal Society: The Case of Sir William Petty - Urte Helduser, Das Monster als Grenzfigur. Leibniz, Locke und die Tier-/Mensch-Mischwesen der Renaissance - Gianni Paganini, Political Animals in Seventeenth-Century Philosophy: Some Rival Paradigms - Indexes.